This three medallion necklace features a suspended disc hand carved from natural serpentine in the shape of a disc to recall the process of personal reflection that primes the resulting longevity of life. 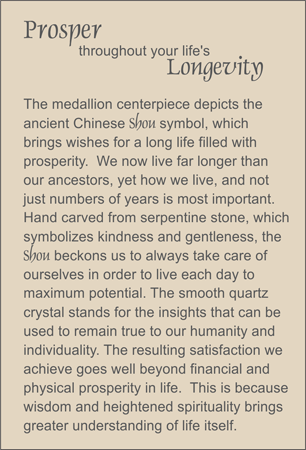 This wish for longevity is depicted by the two carvings of the ancient Chinese shou for long life and prosperity. Sculpted natural serpentine pumpkin beads and flat hexagons are surrounded by trios of faceted flat black onyx ovals flanked by rondelles. Sterling silver toggle clasp.